Genealogy is not an exact science. I believe there are about a hundred thousand people alive now who could trace their ancestry back to Edward III in the 14th century, using the Plantagenet Rolls as recorded by Ruvigny. But this research is notoriously unreliable, and perhaps there is a 50% chance that any one of the 100,000 mentioned above is not in fact demonstrably descended from the Plantagenets. However, the use of DNA samples might one day confirm many of these people’s lineage. When I claim that my earliest recorded ancestor, 8g-grandfather John Lyne, born about 1580, lived and died in Winkleigh, I have perhaps only an 80% chance of being right. But when I claim myself to be the son of Dr Leslie Lyne I think I can claim a 99.99% chance of being right, though it is just possible that my mother had a lover! The likelihood of being accurate in one’s ancestry must diminish with each generation that is followed back, and I am only 95% sure that the earliest parentage I have found in the Dolton parish registers is my 5g-grandparents, Thomas and Elizabeth. What little I know about the first John Lyne or Line is derived from his will (see separate article in this section) which has survived only because he made it on his deathbed in 1654, during the Commonwealth; I have not been able to find any other Lyne wills in the National Archives website, probably because so many were stored in Exeter and destroyed in the blitz in the Second World War. But as John died during the time of the Commonwealth, and Oliver Cromwell had ordained that all wills should be proved at the Prerogative Court at Canterbury, these survived the war, even though stored in London. John was a husbandman and had very little property to pass on. He left his son, Edward, only twelve pence, but probably he had already given him his holding of land; his two daughters each received £6 13s 4d, which equated to about the annual wages of an agricultural labourer. The will confirms his wife’s name as Izott, and his son’s name as Edward; so in the list of men of Winkleigh who swore the Oath of Protestation in 1641 I am confident that the John and Edward Line are father and son . I had not met the Christian name Izott before, but apparently it was not uncommon in the West Country in those days, and variations of it were used in Victorian times. Edward appears to have had at least six children, the youngest being Thomas, born 1646; I know nothing about this Thomas except that he had the misfortune to lose his wife and three children in 1678, presumably from natural causes. It is by his second wife, Margaret that my 6g-grandfather Thomas was born about 1685, and from this ancestor onwards I am more confident of my pedigree. Thomas and Margaret had at least this one son, Thomas, who was born in Roborough, near Dolton. In 1720 he married Elizabeth Western, who had been born in Dolton; they had two sons and three daughters, the youngest of them christened Priscilla. If when our daughter was born I had known of this ancestor born 220 years previously I should have tried to persuade my wife to name her Priscilla! The family must have moved into Dolton about 1725, as the first child, Thomas, does not appear in the Dolton parish registers, and the next, Elizabeth, was christened there in 1726. This Thomas died aged about nine, but George survived to become my 4g-grandfather, born in 1731. So began the blacksmith dynasty of the Lynes of Dolton, which lasted for about 160 years. George Lyne was the first ancestor that I know who was a blacksmith. 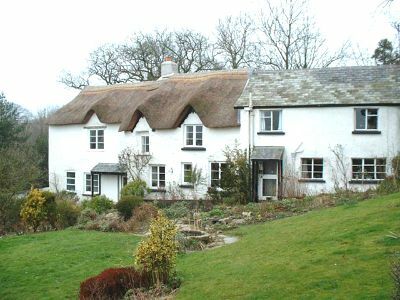 He lived on the outskirts of the old village of Dolton, at Pool Cottage, Iddlecott in his last few years, and died there in 1806. At that time there were two or three cottages at Iddlecott, but I think he lived in the middle part of the present house (see photograph above). He and his wife, Anne née Brock, had thirteen children, three christened Thomas; the first two probably died young, but I was informed by the late Peter Laslett, author of the excellent book “The World we have lost”, that it was not uncommon in the 18th century for two or more siblings to be given the same Christian name. The third Thomas was my 3g-grandfather, born in 1764. All I know about him is that he was a blacksmith, he married Dorothy Hancock in 1787, and signed his name clearly as “Thomas Line” in the marriage register. I do not think this was through ignorance, but rather that they were not so strict about spelling in those days. They had six children, the first being Thomas, the third Elizabeth. Thomas, my great-great-grandfather, married Mary Budd in 1813, and she could not write her name and signed the register with her mark; in 1811 Elizabeth had married Mary’s brother, Daniel Budd, so there were two links between the Lynes and the Budds. Thomas Lyne and Dorothy Hancock. As we approach the twentieth century I have been able to find out much more about the ancestors, as apart from the parish registers there have been available census returns, BMD certificates, wills, gravestones, tithe apportionments, newspaper reports etc. Great-great-grandfather Thomas and Mary had eight children, among them William, their eldest son and my great-grandfather, and a daughter Elisabeth who had an illegitimate son, probably by a member of the Budd family, as he was christened William Budd Lyne. 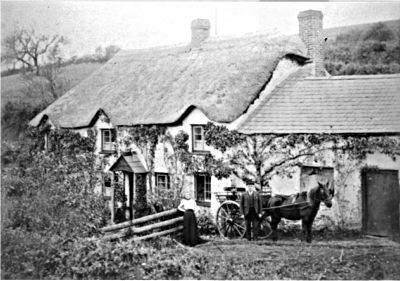 The family lived in Brook Cottage, which survives to-day, but has been altered to make a fine residence; the black and white photograph shows it as it must have been in Thomas’s day, with the smithy on the right. The present owner showed me round, and gave me a horse-shoe (one of many found in the large garden): I like to think that it was fashioned by either Thomas or his son William. Sadly, Thomas was not a good businessman, and was imprisoned for debt in 1820 In those days he might not have been released until the debt had been paid, but fortunately the government passed a law for “The Relief of Insolvent Debtors” about this time, and he was released later in the year, on the understanding that the debt would be repaid in instalments. I sometimes wonder if one reason for his insolvency was the reluctance of wealthy hunting people to pay their bills on time; one of these was Parson Jack Russell, who lived not far away and hunted six days a week and never paid his bills! 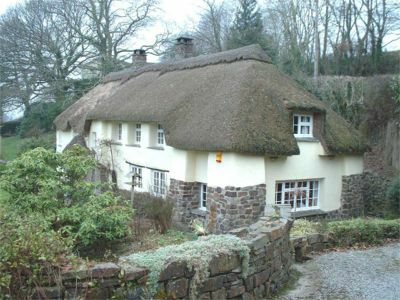 Thomas died in Brook Cottage in 1865, at the age of 77, and Mary lived to age 85. From “A Short History of the Baptist Churches of North Devon"
“Another preacher was Mr. William Lyne. We think of him as full of sacred impulsion. Having a powerful voice, and being accustomed to wield the hammer on the anvil, he, in prayer and speaking, would use his right hand and arm with great force; and not infrequently startle by the sound of the blow. A truly good man, by life and work he sought to bring sinners to the Saviour. His addresses turned to Jesus as the needle to the pole." Until I read this I had no idea that my recent ancestors were Baptists, and that my father had been brought up in a Baptist household. William was 40 when he married Ann Bulleid, aged 36, in a Baptist Chapel in 1855. She was youngest daughter of another Baptist, Samuel Bulleid, a well-to-do farmer/butcher in Dolton; she had looked after her elderly parents until they died when she was 29. Her mother’s family were also well off, and Ann inherited several properties in Dolton. William and Ann had two daughters and a son, William Bulleid Lyne, my grandfather. From at least 1881 William had a drapery and grocery business in Dolton: perhaps after the age of 60 he was not strong enough to continue as a blacksmith, and his son was disinclined to take over; but most likely the agricultural depression of those days was hard on rural blacksmiths, so he took an opportunity of diversifying into trade, much as many farmers are doing now. When he died in 1892 he left his married elder daughter £35 (probably she had already had a handsome dowry); his younger daughter the dwellinghouse and shop with storehouses and garden attached known by the name of Rose Cottage, together with all his household furniture and personal effects and the smith’s shop across the road. My grandfather, by then married and living in London, received “two dwellinghouses situated in Chapel Street, Dolton, with garden and outhouses attached”, as well as the proceeds of a £100 life assurance policy. 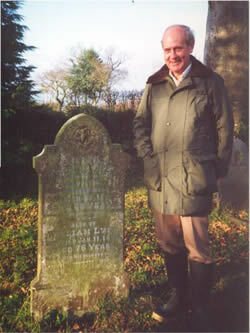 This photograph was taken in 1989, with the writer standing by the grave. William Bulleid Lyne was the last of the family born in Dolton, and it is interesting (for me at any rate) to speculate on how he came to leave the region where his ancestors had resided for at least 300 years. The rural depression of the late 19th century must have been the stimulus, and the coming of the railways had made the journey easier, but how did WB (as I shall call him) make the transition from rustic to townsman, and establish himself in trade in London? The answer to this question I have tried to ferret out by myself, as my father had died before I had any inkling that my family had its origins in central Devon, and none of my surviving relations know any more than I do. I discovered that WB had had a private education at a boarding school at Ashwater, some 20 miles from Dolton. His father must have been well enough off to afford the fees, perhaps with the help of his wife’s inheritance; I have written elsewhere on the Devon Heritage website about this school (see the article on Hampden House Academy of Ashwater). At any rate, about 1876 WB was introduced to the Fore Street Warehouse in Cripplegate, where he was one of about 100 young men learning the drapery trade. When, in 1890, WB married Alice Doyle in Maze Pond Baptist Chapel, his address was 104 Fore Street, a part of the warehouse. Maze Pond Chapel, originally near Guy’s Hospital in Southwark, was translocated to the Old Kent Road in 1877. The Doyles originally came from the neighbourhood of Guy’s, and WB may have attended the first Maze Pond Chapel, and followed it out to the Old Kent Road, where Alice and her family were then living; I expect it was through chapel attendance that he met her. Alice was the eldest daughter of a wealthy engineer, who provided generously for all his six children. So, like his father the blacksmith, WB married well. With Doyle money he became a master draper, having a shop in the Old Kent Road and another near Elephant and Castle, and the family moved into a house on the south side of Clapham Common. Their children, Howard born 1892 and Leslie (my father) born 1895, attended St Olave’s Grammar School, at that time in Bermondsey. Howard won an exhibition to Merton College, Oxford and after winning an MC in the Great War entered the Indian Civil Service; later he became a solicitor. 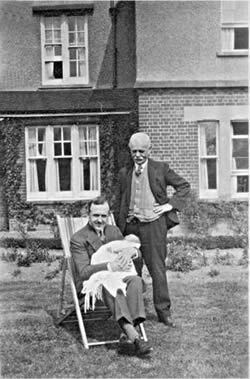 Leslie studied medicine at Guy’s Hospital, borrowing money from the Doyles for the tuition fees, and became a general practitioner in Hove (see left). So the transition of the Lynes from the working class in rural Devon to the middle class was complete, and although there were eight other Lyne families* in Dolton in 1851, within less than 100 years they had all gone. In 1914 Alice Lyne died of tuberculosis, just before her 49th birthday, and from then on the drapery business declined, and it does not appear in trade directories after 1915 Perhaps WB was no better a businessman than his grandfather who was imprisoned for debt. At any rate he died of old age in Hove in 1944, without leaving any money, so far as I know.